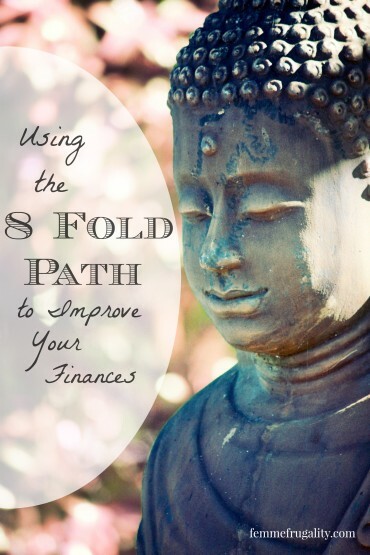 Last week we started exploring how Buddhism’s 8 Fold Path could help us on our way to resolving financial difficulties. This post picks up where we left off. To catch up on what you missed, click here. While the term is “right speech,” a better term may be “right communication.” This includes talking, of course, but in our modern day world of tweets and blogs and email, it includes the written word more than ever. Right speech means using our communication to help and lift up as opposed to lying, gossiping, purposefully using ambiguous language, or otherwise tearing others down with our words. That’s not to say you should remain silent at all times. As a wordsmith, find ways to express yourself that build others up. A lot of times the people we see are doing good things; use your words let them know! My apologies as I get on my high horse here. Right after I talked about “Right Speech.” I know that everyone has a different moral compass and different opinions on what is “good” and “bad.” These examples just include what I consider to be good and…not so good morally. You don’t have to agree with me. Please just take them for what they are: examples. I know a lot of people who have worked for fracking companies. Some of them have left because of the huge moral dilemma it put them in, as they saw laws being broken and the environment being sold for a quick buck today rather than a healthy planet for generations. Some of them didn’t care less, and are still there today. Either way, they made mad bank when they were working for them. My opinion: I’m really proud of the people who left. What we do at our 9-5 isn’t the only way we make money. A lot of people have money in investments. A lot of people have no idea what their investments are in. Some of them are in companies that don’t really have the best ethical practices, making our planet a worse place not only for the environment, but for other human beings. Again, my opinion: a better option seems to be socially responsible investing, which can either make your livelihood (or future livelihood) neutral by removing all companies that participate in what you consider to be unethical practices, or helpful, by purposefully investing in companies (not usually charities) who are trying to do good across a whole spectrum of causes. Right Effort is exerting yourself to cultivate wholesome habits, and making a concerted effort to rid yourself of the not-so-wholesome ones. While Right Action is all about interacting with the world around you, Right Effort is more of a mental game. Personal finance is, above all else, a mental game. The steps to financial freedom are relatively simple: pay off any debts (or don’t take them on,) live within your means, if you want to earn more, take steps to do so, and save, save, save. As simple as that is, we’re emotional beings. We want things. We don’t always make the most mathematically sounds decisions. But when we put in the effort to stop the bad habits, like eating out or racking up debt on consumer goods, we can overcome those emotions and do what will be better for us and our families in the long run. When we put in the effort to start positive habits, like socking money away for saving and believing that we’re worth enough to negotiate over our salaries regardless of our gender, we will see even more positive results in our financial well-being, causes stress and suffering to ebb. This is perhaps the hardest one for me to conquer. I’m a worrier, and have trouble staying planted firmly in the present, which is what Right Mindfulness is all about. Savoring every second that you have here and now, largely because of the impermanence of it all as we discussed in Right View. If you know something good is not going to be here forever, love it as hard as you can today. When we’re trying to overcome financial hardship, we may worry, or we may become workaholics, stressing over our workload even when we’re physically removed from it. Working to pay off debt or get your financial house in order is a good thing, but when it causes us to not be able to enjoy the relationships and experiences that are happening today, we have to ask ourselves: what are we working for? When tomorrow comes and you’ve reached your goal, there will be another one waiting on the horizon. If we don’t train ourselves to enjoy the journey and be grateful for what we have today, we may disallow ourselves from escaping that stress and suffering. This one is usually associated with meditation, or a mental culture. The idea is to cultivate your mind to only have wholesome, positive thoughts. Many people meditate to “center” themselves. I’ll take the analogy from here since I don’t know that the more in-depth four Jhanas of Right Concentration apply directly to our money, though they undoubtedly apply to our lives. With money, as all things in life, we need balance. We should work hard, but no to obsession. We should save, but no so that we become misers. We should enjoy the moment, but not so frivolously that we endanger our ability to provide for ourselves and those we love in the future. When it comes to your finances, center yourself. All eight folds are meant to work in tandem, not as steps or independent of each other. Even the meditation of Right Concentration can be used to center our whole selves, helping us achieve that Right Mindfulness, Right Intention, and all of the other folds. This entry was posted in Money Management, Think on October 13, 2014 by femmefrugality. Right Speech – Debt Debs recently posted about constructive responses on others’ blogs. It’s a tricky one to navigate. What I consider to be right speech might be offensive to someone else – and vice versa. Right Mindfulness – I have found that there are times when I am uncomfortable as I try to develop a new habit, or I stress over details of finances. But I think that’s OK. It think it’s an inevitable part of a learning curve. It passes, and the new habit becomes normal – or the financial detail gets figured out. Great food for thought in this post! Thanks. Just read that post! Couldn’t agree more. Just because we disagree doesn’t mean we can’t edify with kindness and humility. And the process can be, and probably will be difficult! It’s all a part of growth. Thanks for following up on part 2! I like it! I really like how you are relating Buddhism and finances. Right mindfulness is extremely important. Even just having the right mindset is so important. Money is much more mind than anything else. Great post! I like the series. Absolutely. While it’s all about numbers, how we manage those numbers ultimately comes down to how firm of a grasp we have on our emotions. You’ve done a great job at giving examples for each one. I think that both buddhism and your personal finances take lots of time and mistakes to get just right. The older I get, the more I learn how to deal with my finances in the “right” way. It’s definitely a process. Life is suffering, so instant perfection would be impossible. Wow – what an interesting application and perspective. As always, thank you for the helpful tips!